Duration : Approximately 3 hour. Available : We provide regular services daily to Langkawi from Kuala Kedah. Duration : Approximately 1 hour 30 minutes. Available : Regular services to Langkawi from Kuala Perlis is provided daily. Duration : Approximately 1 hour 15 minutes. Available : Regular services to Pulau Payar from Penang is provided daily. For Reservation : Book through the reservation page or email us or call or fax us. 37 & 39, Jalan Pandak Mayah 5, 07000 Langkawi, Kedah Darul Aman. Ground Floor, PPC Building, Pesara King Edward, 10300 Penang. Langkawi Eagle Square is one of the most prominent in Langkawi. The brown and white coloured eagle which soars high over the sky, is claimed to be brave, handsome and mighty and is found in every corner of Langkawi. 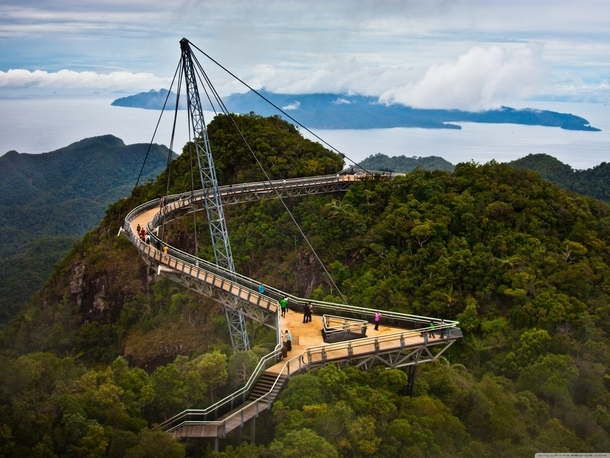 Langkawi is an abbreviation of the Malay words 'helang' (eagle) and 'kawi' (reddish-brown). A park of landscape arts, all created to bring to life legends and myths. The park also features Malaysia's rich cultural heritage and traditional handicrafts. Galleria Perdana which is the Premier Museum in Malaysia, houses all the honour of Prime Minister Dato' Seri Dr Mahathir items throught his work for 20 yrs as a government servant. It is located in an area called Kisap which is very close to the only Indian Village in this island. Galleria Perdana the one and only place where one can have the opportunity to view the priceless items and appreciate the uniqueness and diversity of the various arts and culture portrayed and presented to our Prime Minister in appreciation and knowledgement of the generousity of the various donors. The placid beach is speckled with black sand. Iron oxide is believed to be the cause of this phenomenon. The tomb of the beautiful Princess Mahsuri who was wrongfully put to death. Before she died, she laid a curse on Langkawi, that the island would not prosper for the next 7 generations. This oceanarium was voted "Best Man Made Tourist Attraction '96/'97". Featuring 5000 varieties of fishes and other exhibits from 500 species of aquatic life. All prices are quoted on per pax basic and subject to change without prior notice. Certified Diver = One with a valid scuda diving certification card. LFS offers you a fascinating one-day tour of Pulau Payar Marine Park. Nestled amongst a cluster of tropical islands that lie at the northern end of the Malacca Straits, off the Kedah Coast, Pulau Payar is haven of pristine and natural beauty. Gazetted as a marine park since 1985, this tranquil islan is reputed to have the largest number of coral species in the country. Not surprisingly, it is one of the favourite havens for snorkelling and scuba diving in Malaysia. A high speed, fully air-conditioned ferry will take you there in 2 hour. White sandy beach for sunbathing & picnics. Crystal clear water & enchanting marine life. Copyright © 2008 - 2013 Langakwi-Ferry.com. All rights reserved.